A good-looking, affordable NAS box with top-notch components, but there are a few gaps in the rapidly expanding feature set. 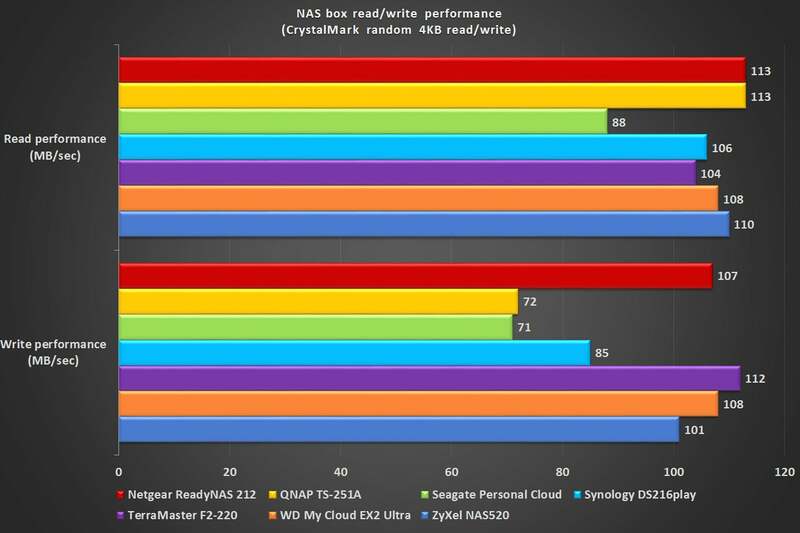 Color me surprised: TerraMaster’s NAS boxes were unknown to me before a random email from the company just as I was starting in on several reviews. Color me doubly surprised, because TerraMaster not only does NAS, it does the hardware extremely well and offers an operating system with good basic features and a lot or promise. The F2-220 is a handsome, brushed-aluminum box with two easy-swap front-accesible drive bays that retails for $240, though we saw it online for $190. That’s without drives, of course, but it does include a 2.41GHz Intel Celeron J1800 CPU, 2GB of system memory, and 8GB of NAND to hold the basic operating system. Hardware of that caliber is generally found in boxes costing quite a bit more. Connectivity comes courtesy of a single ethernet port and two USB 3.0 ports on the back. Unlike some thoughtfully designed NAS boxes we’ve seen, however, there’s no front USB or quick-copy button for camera and video buffs looking for easy offloads. Head-on view of the FS-220. There’s no front USB or quick copy button but the unit is definitely nice-looking. The F2-220’s setup and HTML management interface, at least in concept, rivals that of QNAP and Synology, with windows-in-a-browser and lots of basic Linux apps. It’s still a work in progress, though. For instance, you can’t drag the icons around the desktop, and there’s no timed spin-down of external USB media, among other omissions. 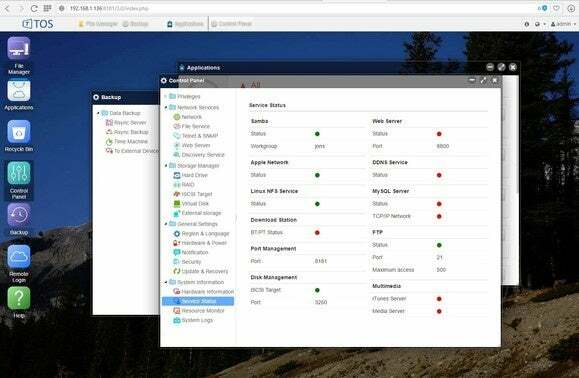 But what’s there—and that includes SMB and corporate features such as iSCSI, virtual storage, Web site and email serving—is generally done well. More germane to this review, there’s DLNA and iTunes serving, as well as a Plex Media Server. Between the three, that covers streaming to any computing device. There were zero issues streaming to multiple devices, though as on other boxes, Plex’s DLNA service didn’t work across our test network. TerraMaster’s own DLNA server did, so all was well in that regard. TerraMaster’s TOS NAS interface shows great promise, but it’s still immature in many minor respects. Another area where software immaturity popped up: The iTunes server enumerated video files to the iTunes player, rather than just music, as it should. Not a deal-breaker, but annoying. On the other hand, the F2-220’s ability to read my exFAT thumb drive was a nice surprise, especially given that support is not listed. That feature costs you a couple of bucks on QNAP and Synology’s boxes. Why exFAT? It’s the format of choice these days with USB drive vendors because it's read and write on both PCs and Macs. It also requires that companies supporting it pay royalties, hence my surprise. Backups to the F2-220 completed quickly, and the box supports ftp (as a destination), rsync (client and server), and Time Machine. You can also back up to an attached USB drive. The 4K UHD (2160p) streaming was like butter. Though not quite as fast as the Netgear ReadyNAS 212, or QNAP and Synology’s faster boxes, it’s not far behind and it's a heck of a lot cheaper. The Web portal that allows easy remote access to your F2-220 is found at www.tnas.online. As with all NAS boxes, you may access it remotely by traditional port forwarding (router settings) and your public IP. 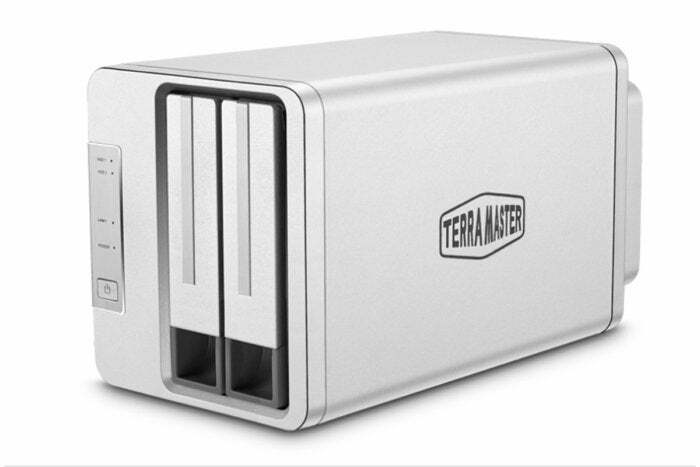 The TerraMaster F2-220 delivered a smokin' write performance. 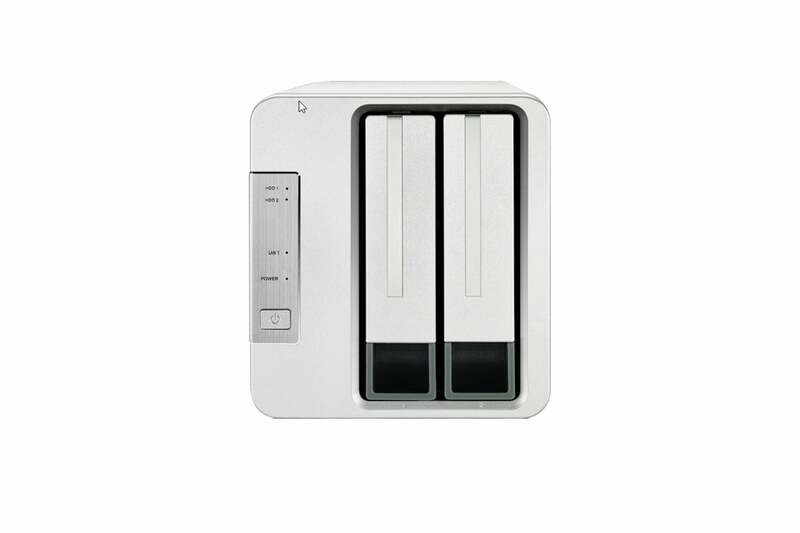 The F2-220 falls a tad short of the competition in its support of online storage services. There was just Dropbox, where most NAS boxes also support at least OneDrive and Google Drive. TerraMaster says it’s working on power scheduling and ftp backup, as well spinning down external drives. TerraMaster’s F2-220 may not have been on your radar either, but it’s definitely worth a look. The software has a few unfinished edges, but it’s still an excellent performer for the price, and its aluminum construction makes it as rugged as they come. Note: This article was edited 2/23/2017 to reflect that fact that TerraMaster now allows timed startup and shutdown. An absolute steal in terms of its hardware, the F2-220's software remains a work in process. The OS is slick and handles the streaming basics, but configuration of some of the apps can be tricky and there are oversights.